Yesterday afternoon the first egg hatched. On seeing the nestling for the first time the male(partial albino bird) spent alot of time gently touching it with his beak. Later I saw him feed the nestling for the first time. This morning, the two other eggs remain unhatched. 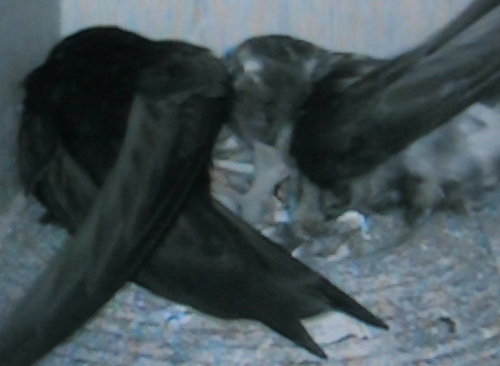 This is not surprising because swifts lay eggs two days apart. This way if there is a shortage of food due to poor weather the first hatched has an advantage and is more likely to survive. Baby swift about an hour old- 18th June. Copyright Jonathan Pomroy 2012. 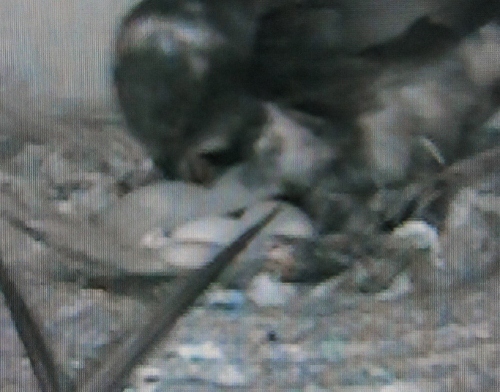 Baby Swift being fed by parent- 18th June. Copyright Jonathan Pomroy 2012. A portrait of Swifts. My first book. Many thanks to Simon Gurr for his invaluable help setting up this blog.